Sharing of inventory information – Goverlan stores system information in a database backend so that it can still be queried if the system is offline. In Team Collaboration, inventory information is shared to improve performance and data availability. Sharing of Goverlan objects – When Team Collaboration is active, one administrator can share or enforce different Goverlan configuration objects (e.g., software packages, scripts, etc.) with the rest of the team. To enable Team Collaboration, simply configure all operators to the same database backend (See Database Configuration – Operator Side). Once Team Collaboration is enabled, you will be able to publish, share or enforce Goverlan configuration objects with your team. Whenever you configure a Team compatible object, you will see the Team options in the user interface. Enforce on my team: Forcefully shares the object with your team, locks the object that can only be edited by the admin who enforced it and auto-appears on the Goverlan users Object Manager. Share with my team: Shares the object with your team and auto-appears on the Goverlan users Object Manager. The shared object is not locked and can also be edited by anyone on the team. 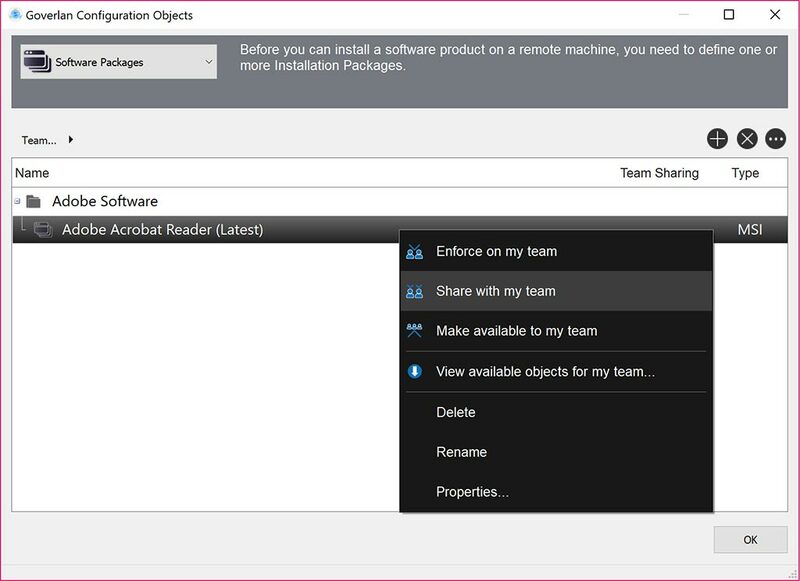 Make available to my team: Shares the object to the Published Objects section that can be accessed and imported by a team member. These objects do not auto-appear and will only show in the Goverlan Object Manager when imported. View available objects for my team: This is to access the Published Object section where other team members have made their objects available via the “Make available to my team” button. In addition to configuration objects, Goverlan also provides a Shared Favorites section when browsing for favorite devices. Favorite Devices are available in the Administration & Diagnostic feature, the Goverlan Remote Control feature, and WMIX. Any configuration made to the Shared Favorites section is automatically pushed to the team.